Guest Post: Orly Ravid "New and Compelling Options for DIY Distribution"
Orly Ravid co-founded the Film Collaborative and has been providing us with a great series of posts on the changing market and options for independent filmmakers and their work. Her generosity and commitment is an inspiration. She is a brave thinker. Indie Filmmakers used to think that once they made their movies, their only real option was to surrender -- to surrender to the market and the middlemen who decided on a film's applicability to an audience or community. Those days are now gone and good riddance! The services and tools we have to get our work out and on the screens of what has long been under-served under-educated audiences and communities increase every day. As those options expand, so do the choices of content, form, and aesthetic -- we are becoming truly free in terms of how, what, and where we can tell our tales. The sky hasn't fallen; a thousand phoenix have risen. In a new media world in which people sometimes conflate distributor with platform and buyer with online/digital store, I want to draw that distinction and highlight a few new and compelling DIY options (platforms or toolkits) for filmmakers to sell or rent their films to audiences / consumers directly. 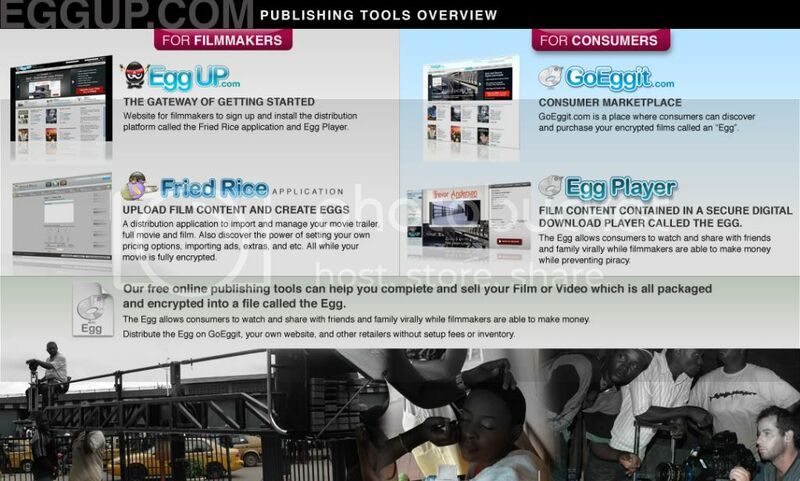 TFC always encourages filmmakers to develop their own brands while also noting the importance of being connected to other brands that generate significant traffic and indie film consumption. In other words, sell direct to your fans off your site and other sites and social networking platforms and/or via other DIY platforms or tools but also recognize the usefulness of being available where average film consumers go, i.e. via Cable VOD if you can manage it, and other key platforms/online digital stores (depending on the nature of the film) such as: Amazon, Netflix, iTunes, Vudu, Hulu, Sony Playstation, Xbox etc. The few DIY platforms or toolkits highlighted in this blog are: Distrify, EggUp, Groupees, Stonehenge’s iPhone Apps. Next time we cover this topic, we’ll investigate more into DIY platforms FansofFilm and Open Film (7,000 films, 70% shorts). Peter Gerard & Andy Green, the co-founders of Distrify, are both filmmakers who formed Distrify. I met with Andy @ SXSW. You can then start telling your film's fans about it and ask them to embed the widget on forums, blogs, websites, etc. Distrify's "sell-movies-socially" tools are designed to make effective social media marketing profitable. If your trailer and film are on Distrify, when you share the clip, you're also sharing the store to buy the film or find out about upcoming screenings. When your audience shares it further, you're always spreading the point-of-sale along the way. Anyone who shares it gets paid a share of sales they generate. If the film's not available in the user's area, they can make their interest known directly through the player as well. Distrify compiles the statistics for filmmakers and give them the mailing list data - all free. Any new screenings you add are also automatically listed in all the players that have been embedded around the web. And when you want to start selling the film, you can add it as well. They split the 5% affiliate revenue with the filmmaker. Beta users will be given a special offer when they leave the Beta period, and normal account pricing will be determined at that time. And filmmakers keep all their rights. How do you get paid? Each month if you've earned sales revenue they will send you a sales report and transfer your earnings to you directly via PayPal or bank transfer. You may be charged by PayPal or your bank to receive the transfer. When you get your first sales report, they say “just let us know how you prefer to be paid”. What about affiliates? Peter Gerard followed up further noting that whilst still in Beta their pricing is FREE to sign up and sell one film and a 30% transaction fee on all sales through their player and there are no costs for special encoding. Their Beta period ends in June and after they will continue this pricing option and offer some premium plans. Payment options: FREE, Rental, Purchase. Filmmaker will be able to choose several options. Accept Paypal and major credit cards. Customer credit card information does not go through their servers. They only link to the filmmaker's Paypal account. Paypal holds customer's credit card info. They are Worldwide and can Geo Filter as needed. Content: Currently about 60 films due to focusing on developing technology and negotiating deals with international governments and studios. They will be ramping up pretty quickly in the next 3-5 months with content. When I asked about revenue thus far to filmmakers they answered with this: “It really varies since it's up to the filmmakers. Some filmmakers make $0 due to they are not marketing their content or older film with no cult following. While others are getting consistent purchases daily since they have a full marketing strategy including PR pushing their film. It adds up but nothing making millions”. EggUp noted that they are reviewing their fee structure and may be changing it soon. I was introduced to this platform via TFC client (and HopeForFilm Guest Blogger) Ari Gold (Adventures of Power). Thomas Brooke who demo’d the platform / service via Cisco’s WEBEX. I was impressed with the simplicity and comfort of the interface. Their next Groupee starts on Wednesday so if you go to: http://groupees.yawma.net you will see the promo vid and count-down clock now live. Here is a screenshot and the model we're using for projections on Music groupees. FEES: The model split is reflected at 60-40% (in favor of filmmakers). Stonehenge Productions enables film producers to sell their films on iTunes, Android Market and Amazon Appstore as applications for the iPhone, iPad and for Droid platforms. Their pitch: “With a low start-up cost of just $680, you can have an application of your film available on Phones everywhere !! You keep 100% of sales revenues minus the 30% that Apple charges.” What do you get for $680? How? Contact Stonehenge Productions and we’ll provide you with further instructions to upload your content. It will then be turned into a customized application. You’ll get final review and you’ll continue to hold all rights to the film. We’ll submit it to Apple and manage the whole selling process through the App store OR we’ll put it on the Android Market or Amazon Appstore. * That’s all for now folks. More platforms and tools and DIY solutions next time. Orly Ravid has worked in film acquisitions / sales / direct distribution and festival programming for the last twelve years since moving to Los Angeles from home town Manhattan. In January 2010, Orly founded The Film Collaborative (TFC), the first non-profit devoted to film distribution of independent cinema. Orly runs TFC w/ her business partner, co-exec director Jeffrey Winter.